For a four-member band with one guitarist, Montreal's Kataklysm have a gargantuan sound, their "northern hyperblast" bursting forth at weapon-grade decibels. Their riffs were impossibly thick and powered by momentous, no-nonsense bass drumming and a couple of blasts that felt like a sonic boom. Kataklysm were one of many bands to complain about the security fences dividing the audience and call for two circle pits in compensation (vocalist Maurizio Iacono spurring the fans on, at one point, with the taunt, "This ain't Justin Bieber, muthafuckers, it's death metal!"). 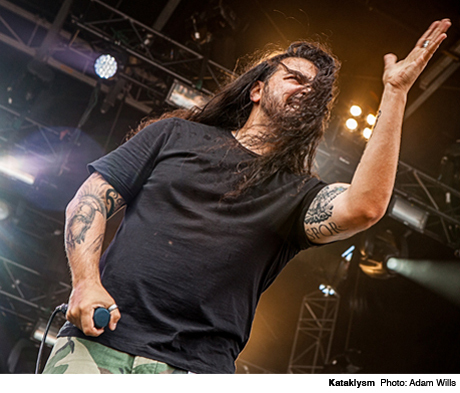 Between songs like "Iron Will" and "As I Slither," their banter was also heavy in national pride, Kataklysm seeking to show those Americans what Canadians are capable of and exhorting the crowd to do the same.